A controversial new housing development scheme on the outskirts of Falmouth has been recommended for approval by Cornwall Council planning officers. Midas Commercial Development Ltd submitted revised plans for the construction of 94 houses off Bickland Water Road on land adjacent to St Budock Church. The plans include the provision of 33 affordable houses. Although the original proposal for 154 houses was recommended for approval by the planning officer in February 2014, the planning committee objected on the grounds of the harm that the development would cause to the character and appearance of the area and that it would have an adverse impact on the setting of the church. 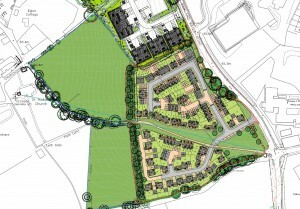 In December 2014 Midas Commercial Development Ltd appealed against the refusal by Cornwall Council to grant planning permission but the appeal was dismissed. The main issues were the effect of the proposed development on the setting of St Budock Church which is listed grade II* and the effect on the character and appearance of the area. Since then the building company have scaled down the development and made the most recent application in September 2015 which takes into account the impact of the development on the views of the nearby church. Midas director Steve Russell said: “We’ve worked hard to take on board the Inspector’s concerns and have come up with a scheme which we hope councillors will feel able to support. “We have significantly reduced the number and density of homes to create more open space, and are maintaining the historic footpath to the church. Crucially, we are proposing to gift two fields next to the church to the town council which has been identified by them for use as a cemetery. This would be legally binding on us as part of any planning permission and would not only protect the rural setting of the church, but also maintain separation between Falmouth and Budock. Falmouth resident Steve Tribes said: “I strongly object to these plans. The rural landscape around Falmouth is in danger of being systematically destroyed. Budock Water is in danger of becoming engulfed by the spread of housing estates. If this development goes ahead it will join Falmouth and Budock Water together. “The proposed site is the buffer between Falmouth and Budock with the ancient little church town, which consists of St Budock Church and former old farm buildings at its heart. If building is allowed on this site it will destroy a quiet, peaceful, rural landscape, with lovely views across the field to the church, forever.